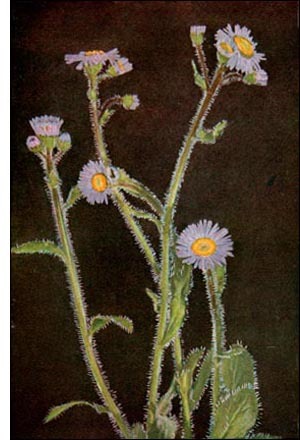 The botanist knows this plant of the hills and banks as one of the species of the genus Erigeron. This name is indicative of one of its characteristics. It is from two Greek words meaning spring and old man. Old man in the spring, or early old, is an appropriate name, for the young plants are quite hoary and this hoariness remains throughout its life. The Blue Spring Daisy is not alone, for it has about one hundred and thirty sister species widely distributed throughout the world, but they are more abundant in the Americas, nearly seventy of these occurring in North America. This unassuming plant frequently grows in large patches, yet does not crowd its fellows; often it grows in localities which the more delicate and brilliant of the early flowers are wont to shun. Though the species of Erigeron are coarse-growing and unpretentious plants, they lend themselves readily to garden cultivation. They are easily propagated and make good borders, for they are much more beautiful when massed than when allowed to develop as single plants. The forms vary greatly in color-orange, creamy white, rose, violet, purple, and bluish illustrate the range of color. The yellow centers heighten the color effect.